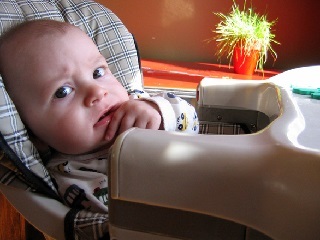 When my son started feeding himself, I got tired of cleaning up the sticky mess he left under his highchair. So I went to Walmart and found they had rolls of heavy-duty clear plastic in two thicknesses, about 60" (152cm) wide. I bought a 60"x30" (152x76cm) piece and cut one to fit under his high-chair - 30"x30" (76x76cm). You could use a tablecloth from the Dollar Store, but since it's on the floor, I found the heavy-duty plastic lasted longer and didn't tear. I still had a second piece of plastic left, so I put the second piece under his car-seat in the car, to protect our seats from wet, muddy or snowy boots and any food or drink spills. You could reuse it when baby gets older, and starts doing fingerpainting, easil painting, arts and crafts. Or a picnic mat at a park, as a table cover for play time, and just about anywhere you need extra protection. Another idea is a Clear Heavy Duty Tablecloth Protector available in most dept stores, and maybe your local Dollar store? Try using yesterdays newspaper. Then you can recycle it. Go Green.